My plan for today was to talk about making the switch to non-toxic laundry soap/detergent, but Instagram changed that plan. I happen to mention a couple of weeks ago that I was trying a popular non-toxic shampoo for an upcoming post. Many reader friends replied to that Instagram Story, expressing excitement about this particular topic. Apparently a lot of you have experienced non-toxic shampoo fails. Me too. The struggle is real! Laundry soap can wait. Let’s talk about shampoo. 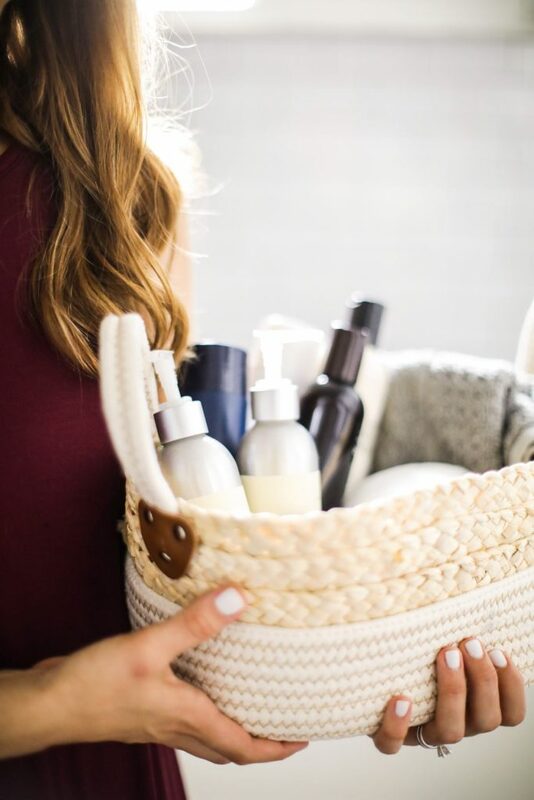 When it comes to non-toxic shampoos and conditioners it seems like there are a lot of products that simply don’t work. Unless you’re going for the greasy hair look. Personally, I was faithful to a particular salon shampoo and conditioner for a long time. It wasn’t until last year that I finally decided to make this switch. Or, at least, take the switch seriously. 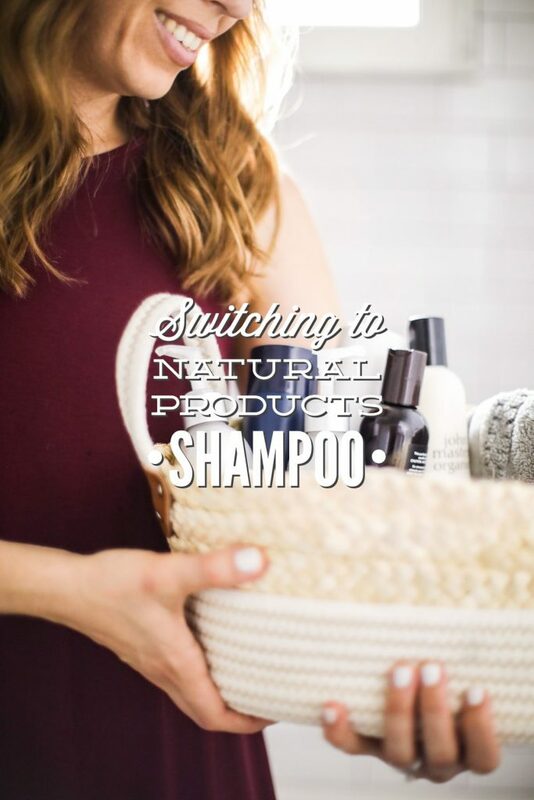 I had dabbled with non-toxic shampoo options in the past, purchasing a bottle from Whole Foods, a local health food store, or Amazon when the salon bottle was empty. But after just a few washes I would go back to my favorite salon brand. I just couldn’t take the greasy hair. I even tried a few homemade recipes on Pinterest. It’s hard to admit, but castile soap isn’t a miracle product for all things in life. If I was going to make the switch to a non-toxic shampoo, the product had to work. It had to clean my hair, leaving it clean and hydrated. I don’t think that’s too much to ask. And if I could get a day or two (or three, because #momlife) out of a wash that was even better. I knew there must be a way to “clean up” my shampoo and conditioner, but still feel clean. This story does have a happy ending. There’s hope! I finally found shampoos and conditioners that work. And yes, that’s plural. I found multiple options! Today, I’m going to share the products that have worked best for me. Products that I’ve personally purchased and used in my own hair, as well as my children’s hair. My husband is still making his way over to the non-toxic shampoo side. 1. I like to include both homemade and store-bought options when talking about making the switch to non-toxic products. For shampoo, I don’t have a homemade recommendation. I’ve tried what seems like every homemade recipe on Pinterest, and every single one has left my hair greasy. That’s not to say that a homemade shampoo (many times made with castile soap) won’t work for you. Castile soap actually works fine as a shampoo in my son’s hair. I’m not discouraging the DIY route, I just don’t have a solid recommendation. 2. When it comes to shampoo, you get what you pay for. Most of the brands that have worked for me aren’t cheap. 3. I have color-treated hair. I go to an “organic salon” in the area for hair color services. Are the hair dye options at this salon perfect? No. But I feel better about the ingredients, and the lack of certain ingredients. The products listed below have worked well for my color-treated hair. 4. If you have very long hair you may want to try shampooing your hair in two sections. This was a suggestion from my hair stylist/colorist. I find that I’m able to reach all my hairs (and I have a lot of them) this way, ensuring the shampoo works as it should. 5. The options on my list receive the “seal of approval” from both the EWG website and/or the Think Dirty App. If you’d like to learn more about ingredients to avoid and how to read an ingredient list, visit this post. And if you’d like to learn more about using the Think Dirty App or the EWG site to find non-toxic products, visit this post. True Botanicals offers samples, for free! Okay, you have to pay for shipping (something like $3). Just click on samples under the product tab on their website and then select shampoo and conditioner. There’s only one shampoo and conditioner. The formula works on every hair type. Only available for purchase via the company’s website. Price. If you love True Botanicals, you can sign up for their subscription box (Sun & Moon) which brings the price of each bottle down to $30. And you get a free gift each time your subscription is delivered. I have my subscription set to every 4 months, which is how often I have to replace my bottles. Innersense also makes fantastic styling products. The leave-in conditioner and dry shampoo are my favorite products. I use the leave-in conditioner in my daughter’s hair and I use the dry shampoo at least twice a week. Multiple shampoos and conditioners based on hair type, including curly hair. Various styling products, too. Take a short survey (hair type, styling preference, etc.) on the company’s website to find the Innersense products that will work best for your hair. Only available for purchase via the company’s website or an online store (like The Detox Market). Some of the products are available on Amazon with prime shipping. Although buying through Amazon will cost an extra $2. Multiple shampoos and conditioners based on your hair need: Smooth and Control, Volume and Shape, Daily, etc. Including a product line for children. Affordable when compared to the other options on this list. I’ve used Acure on and off over the years with mixed results. It’s definitely the best non-toxic shampoo and conditioner found in the grocery store. I can only use this brand for a short time (one bottle) before my hair needs a break. That said, I love Acure’s dry shampoo. It’s very similar to my homemade recipe. If you want to try something that doesn’t require special ordering, and an option that doesn’t cost $20+, give this brand a chance. If it doesn’t work for you, try another option on this list. I don’t think Acure is the best, but if you’re looking for a budget-friendly option, it’s a place to start. Price: $10 for 12 fluid ounces. Multiple shampoos and conditioners based on your hair need: Body Beautiful, Curiously Clarifying, Mega Moisture, etc. Very affordable and easy to find in grocery stores, Target, health food stores, and online. If there’s one option on this list that is not going to work for everyone, this is the brand. This brand doesn’t amaze me like other options on this list (mainly, True Botanicals and BeautyCounter). I have traveled with this shampoo and conditioner because this brand makes travel-size bottles. It cleans my hair, but it doesn’t do anything that seriously impresses me (allows me to go multiple days without washing my hair, volume, etc.) for the price. My main issue is my hair doesn’t feel hydrated after using this brand. I also have very thick hair, so maybe I just don’t have the right type of hair for this brand. This brand has a cult-like following in the green beauty world. 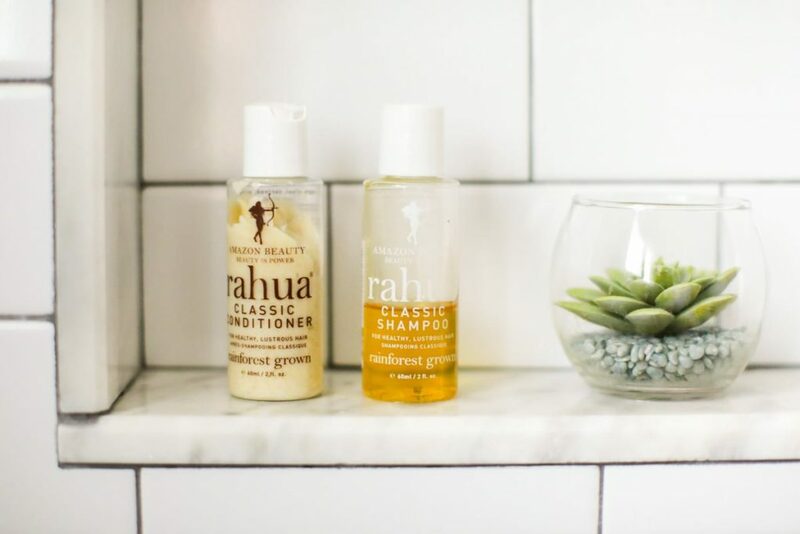 Rahua also makes styling products. Price: $34 for 9.3 fluid ounces. Multiple shampoos and conditioners based on your hair need: volume, hydration, color treated. Various styling products, too. Only available for purchase via the company’s website, The Detox Market, or Amazon. I don’t purchase special shampoo and conditioner for my kids at this point. They use what I have in the shower. If you’d like to use a special kid shampoo, I’ve had good success with Dr. Bronner’s Castile Soap (baby mild is my favorite since it’s unscented) and Pleni Naturals. Both of these work well as body wash and hair wash for young children. 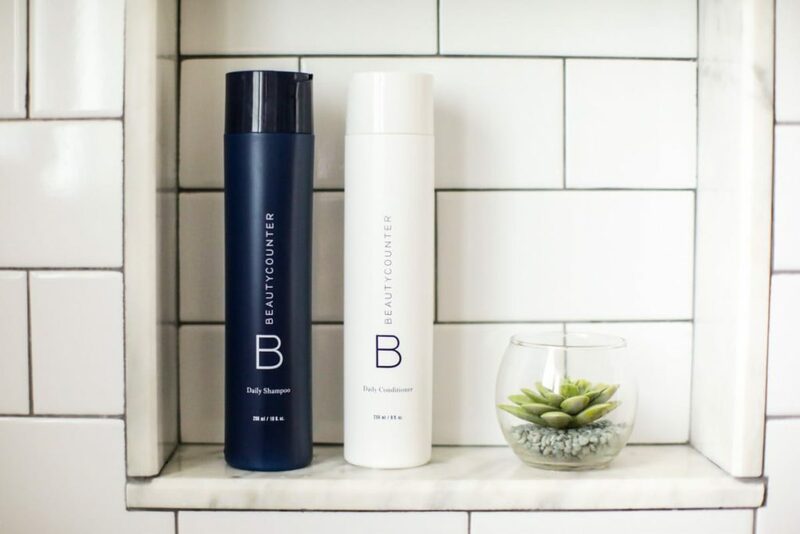 BeautyCounter also makes shampoo for children, along with detangler spray. I personally don’t have any experience with the BeautyCounter kids’ line. I love the detangler from Innersense for my daughter. She has very thick, curly hair and needs some extra help with combing after an evening shower and in the morning. 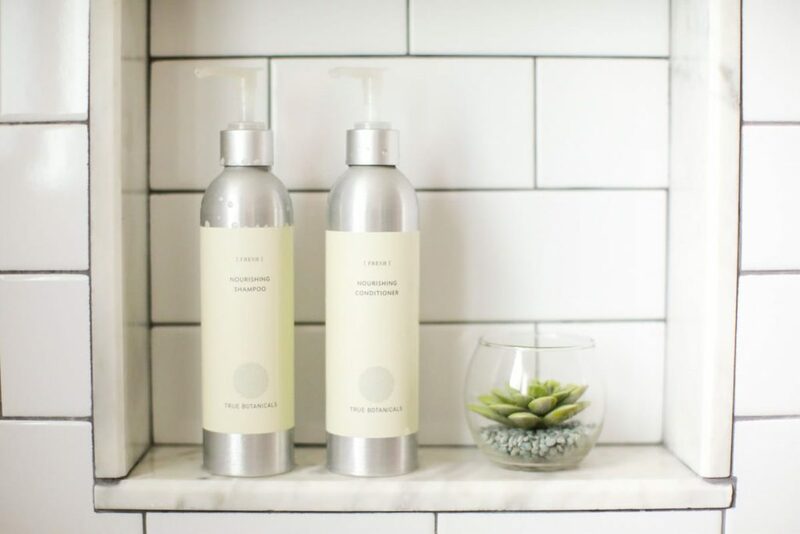 The Honest Company also makes kid shampoo and body wash, and adult shampoo. I haven’t tried The Honest Company line, but it does rate very well on the Think Dirty App and with the EWG as far as ingredients. If you love a particular shampoo or conditioner, share your experience in the comments. I love learning about new brands and products from you all. What did you think of the John Masters? I’m using that now and like it. I have a super dry scalp, so finding a cleaner option for itchy scalp has been quite the challenge. John Masters seems to work well for my scalp however I’m not in love with what it does to my hair. And yeah, I’m only washing twice a week mostly due to busy mom syndrome. 😮 LOVE the Acure dry shampoo. Hey Tamara, John Masters is actually in the basket in the photo because it was going to be on my list. I really like John Masters and it’s worked well for my hair in the past. I didn’t include it on the list only because it appears that they just went through a reformulation of their shampoos (?). I just learned about this after reading some reviews and chats online, and purchasing new bottles (pictured) so I’m going to look into this change a bit more and see if this is really true. There was talk that they added some questionable ingredients, but I don’t know if that’s true (you can’t believe everything you read in reviews ;)). I decided to leave it off my list at the moment, just until I get more answers about this. They’ve been a great company for shampoo and conditioner. Ha, I’m the same way. Twice a week washing mostly due to busy mom syndrome, lol. I agree–the Acure dry shampoo is so good!! It saves my hair on a weekly basis. While I haven’t tried the shampoo specifically, I have recently been purchasing lemongrass spa cosmetics. They are a direct market (in home parties) set up, but offer all natural and organic makeup and other products. My friend is a rep and she was able to visit one of their facilities in Largo. (Near you kristin!) She was able to actually watch the products being made and see the ingredients. I have used several products and plan on slowly switching over from my drugstore brands. Shampoo goes so quickly that I can’t justify spending so much, especially with 6 people in our house. So for now I’ve been using castile soap but I’m not impressed…..
Hey Sarah, Thank you for sharing. I’ll definitely look into Lemongrass Spay Cosmetics. I haven’t heard of them before. Have you tried Acure? That might be a cheaper than other options but more effective shampoo than castile? I have had success with the John masters scalp formula but just saw your comment about the reformulation. Curious to see how that works. I currently use Desert Essence conditioner and it works pretty well but it isn’t the greenest option. Rahua classic shampoo and conditioner wowed me in samples I got from Aillea but the price is holding me back from ordering. Tried Acure and didn’t love it. Shampoo and conditioner are so hard. I’ve also tried True Botanicals which also didn’t wow me. Innersense I used for a bit before realizing the lavender in it (which I’m allergic to) was destroying my scalp. Hey Sarah, Thank you for sharing! I think John Masters is still a great shampoo and conditioner from what I can tell. Even with the reformulation it seems to be cleaner that most options on the market, and it still works really well (just bought new bottles). That’s interesting about Innersense. Do they make an option without lavender? Not for the shampoo and conditioner unfortunately. I have curly hair too so I wish i could use it. Some of their styling products are lavender free. It’s tough in the green beauty world because adding lavender seems to be a given for many companies in their products. I have used the Honest Company shampoo/body wash combo for my kids and love it! It works very well and does not dry out their sensitive skin. We have the orange vanilla scent and it smells sooo good… like a creamsicle! Hey Hannah, Thank you for sharing! That’s really good to hear. I’m curious if you tried any shampoo bars? I have had a long journey with natural hair care, and I stuck with Acure Organics because of price even though my experience was similar to yours. I recently switched over to some shampoo bars I found on etsy. My hair detoxed for a bit, but now it is incredibly soft and manageable. I follow with a very diluted ACV rinse. I love that it is cost effective, working great, and has less plastic waste! Hey Kristen, I’ve tried a couple of shampoo bars, but haven’t had a great experience. Can you share a link the Etsy shop? I would love to try a brand that’s been successful and recommended. 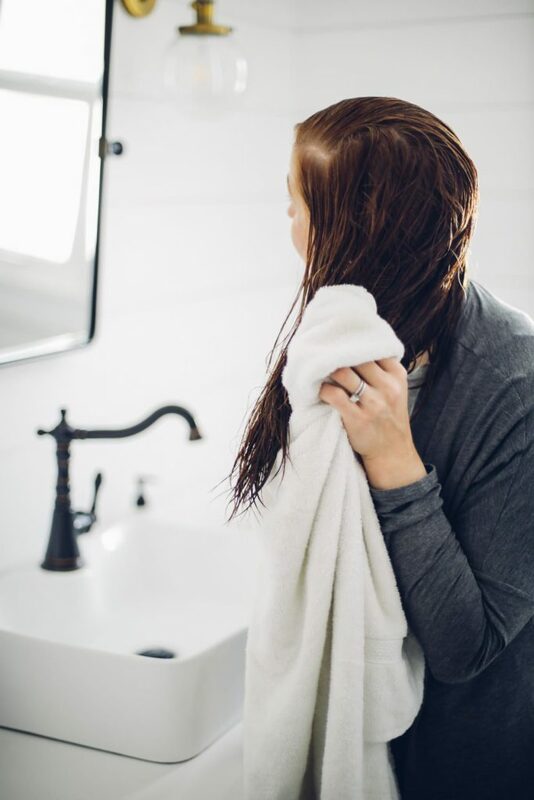 How long did it take your hair to detox before it felt really clean and manageable? This is the shop I’ve used and loved! It has quite the slew of good reviews too! I had already been using low-chem shampoos for years, and it still took a good 3 weeks. It wasn’t pretty. I used bentonite clay as a mask a couple of times and that seemed to help the process along as well as a lot of brushing with a boar-bristle brush. Now, I love the results, it is what I wanted in terms of being soft, manageable, and healthy looking. Thank you so much, Kristen! I’ll definitely order some. That’s really helpful. PS: I’m so glad you’re enjoying the blog :). I just started using innersense for volume and I love it. I decided to do their 14 day challenge (which is 14 days of just their shampoo conditioner and leave in). Theres a 15% code when you do the challenge. I’m only on day five and I love it. My hair feels so light soft and fluffy. My hair is very thick but the strands are very fine so my hair gets very heavy and oily. I have also used beautycounter volume and their daily. They are both great. But I like innersense better. I’ve tried acure and didn’t care for it. Can you tell us more about which dry shampoos you’ve tried and love? This momma needs a clean dry shampoo! Thank you! Hey Stephanie, My favorite is Acure. It’s really a powder dry shampoo. I sprinkle it on my roots at the crown of my head, let it rest, and then blow dry my hair. Hi! I was wondering if you had checked out Monat products? They boast being more natural with green ingredients. Hey Linzie, I did recently after a reader asked my opinion. After looking into their shampoo, I personally wouldn’t recommend the brand or consider them to be a non-toxic option. I would definitely research the ingredients used and ask the company directly about their products. 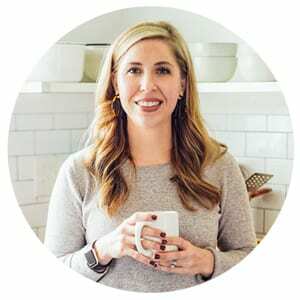 Dear Kristin, love your blog and i admire your effort! i am addicted to Ausganica (an australian brand) lemon myrtle shampoo&conditioner!! i’ve tried avalon organics, faith in nature, sukin, yes to and john master organics (love their hair spray by the way) before. i also tried diy shampoo severel times but like yours every time i felt greasy 🙂 thanks for sharing your experiences! Thank you for sharing, ayca! 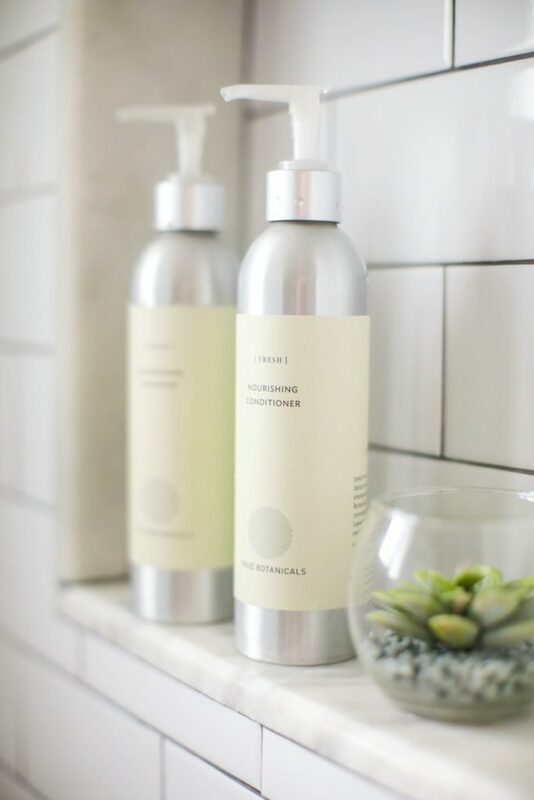 Have you tried PureHaven shampoo and conditioner? I haven’t, Lorrie. Do you like their products? Yes, the products are toxin free and smell great! I sell the products if you are interested. Thanks, Lorrie. I’ll take a look at the products. I am nearing 70, have waist length coarse straight hair. I have literally tired hundreds of shampoos, creme rinses, and body soaps. I now use only African black soap from Ghana I use this one https://www.amazon.com/gp/product/B0084I3XGI/ref=oh_aui_search_detailpage?ie=UTF8&psc. It really is a great soap. It is mildly abrasive cause it is raw, not refined. I use it on my hair, we have extra hard water and it lathers great. I use ACV for my rinse. It returnss my hair to its natural ph and leaves its soft and silky. For body and face I just use a piece I have cut into a bar. As the bar gets too small too work with I add it to a jar with filtered water, making liquid soap, which I also use on my hair. It took a month to get it right. Our hair has so much crap in it from years of using commercial shampoos, what takes years to go in…does not come out over night. Thank you for sharing, mhspear! Side note, I lived in Ghana as a teenager :). Hey Veronika, I’m not sure about products in Europe. I do know that the EU has much stricter laws and rules regarding ingredients and has banned a ton of potentially harmful ingredients. While the US hasn’t banned any ingredients in a long long time. I think we’ve only banned somewhere around 30 and the EU has banned over 1000. That said, I feel like there might be more choices that are non-toxic in your average store in the EU. I could be wrong. Since I’m in the States, I’m not very familiar with companies found in the EU, although I believe some companies like Leahlani Skincare and others are coming over to Europe now. I just Googled, “Green beauty stores Europe” and found this online shop: https://levertbeauty.com/. So this may be a starting point. Also, we were recently in Zurich and I noticed two new green beauty stores in the city center. They sold a ton of the products I love in the States, including brands like Innersense hair products. One is called Green Lane and the other is Pretty and Pure. Both are in Zurich.